If parliament is the temple of democracy, our MPs are its priests. How have these priests performed their duties? Who have been the most diligent in doing their job? The ‘MPs Composite Index’, devised by Social Watch India, a Delhi-based network of civil society organisations, attempts to answer these questions in detail. Social Watch went through countless documents to gauge how the members of the 14th Lok Sabha (the previous to the current house) performed on four parameters: attendance, participation in debates, number of questions raised and the number of private members’ bills proposed. Points were given to over 100 MPs and top 25 members were shortlisted. When all the data was crunched and the final ranking was out, it was surprising, to say the least. In short, it showed that the performance of the members inside the house had no bearing on their popularity (or lack of it) in their constituencies. The top ten best performing MPs – who religiously attended the session, actively participated in debates, raised pertinent queries – hardly ever feature in the mainstream national media (See box). In fact, only four of the top ten MPs made to the 15th Lok Sabha. 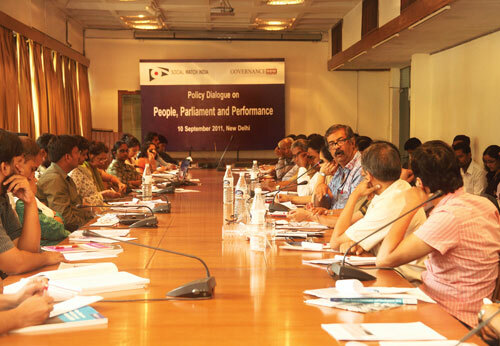 On September 10, Social Watch India joined hands with Governance Now to hold a policy dialogue to discuss the index and its findings. Representatives of three leading political parties – one of them an MP – apprised the role of a parliamentarian with a welcome candour, while experts on the panel offered a critical look at their performance and also at the performance index. The three political leaders were Jesudasu Seelam of the Congress (Rajya Sabha member), Nilotpal Basu of CPM (ex-Rajya Sabha member) and Nirmala Sitharaman (BJP). Amitabh Behar of the National Social Watch and B V Rao, editor, Governance Now, opened the session. Behar put the dialogue in context, saying that Anna Hazare’s movement had raised important questions of political accountability and, more importantly, institutional accountability – the MPs Composite Index being an effective way to gauge them. Rao remarked that the next edition of the index could do well to broaden the parameters. Sanjay Kumar of the Centre for Study of Developing Societies too underlined the need for a broader evaluation of our MPs, going beyond quantifiables like attendance and looking into the quality of their interventions. Girish Nikam, a seasoned journalist and the coordinator of the index study, agreed and said two more parameters would be considered for the next ranking: special mentions and calling-attention motions. Manisha Priyam, who teaches political science at a Delhi University college, moderated the discussion. In the following pages, read excerpts from the interventions Seelam, Basu and Sitharaman made in the policy dialogue.